Striking doctors stage demo at Parirenyatwa. 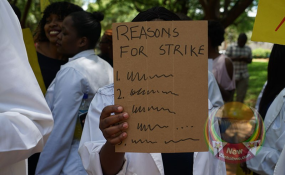 Zimbabwe's health sector crisis rages on after the striking medical doctors who had earlier been reported to have aborted their industrial action insisted that they are incapacitated to report for duty. Medical doctors have been on strike since the 1st of December last year pushing to be paid in United States dollars and an improvement in the supply of drugs in public hospitals among other grievances. In a statement to the media late yesterday, doctors maintained that they are incapacitated to go back to work despite frantic efforts by government and first lady Auxillia Mnangagwa to have them abort their industrial action. "The ZHDA carried wide spread consultations fits members as per agreement. The ZHDA members nationwide however felt that the agreement did not take cognizance of their immediate incapacitation in a raging economy as no current offer was made on the remuneration of the doctors to improve their welfare. Additionally, there were no timelines and valuable targets for the provision of Drugs and protective equipment to government Hospitals. "The ZHDA members have therefore remained incapacitated and will not be able to resume normal duty till these matters have been addressed by their employer. It is important to note that the few available ZHDA members who showed up for duty in various hospitals have done so as a sign of good faith and remain in solidarity to those at home. It is our hope that the situation will be resolved with the urgency it deserves," said ZHDA. Government is understood to have offered doctors inducements that include fuel scheme, transport allowances free duty to import cars but has refused to give in to their demands to be paid salaries in foreign currency. The government has since said it cannot pay its civil workforce salaries in foreign currency as it the central bank is overwhelmed with the key economic sectors that require foreign currency like fuel and power supply.